Lemon & Vanilla: Millefeuilles with Vanilla Crème Pâtissière & feathered Fondant Icing / Mil Folhas com Creme Pasteleiro de Baunilha, decorados com Icing Fondante. Millefeuilles with Vanilla Crème Pâtissière & feathered Fondant Icing / Mil Folhas com Creme Pasteleiro de Baunilha, decorados com Icing Fondante. 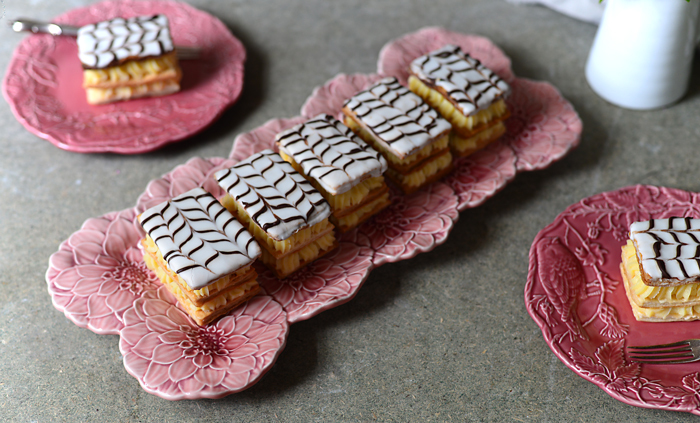 This month and for th 20th edition of the Sweet World, we're asking you to make Millefeuilles. Millefeuilles are a classic French pastry that consists of layers of puff pastry and cream filling. 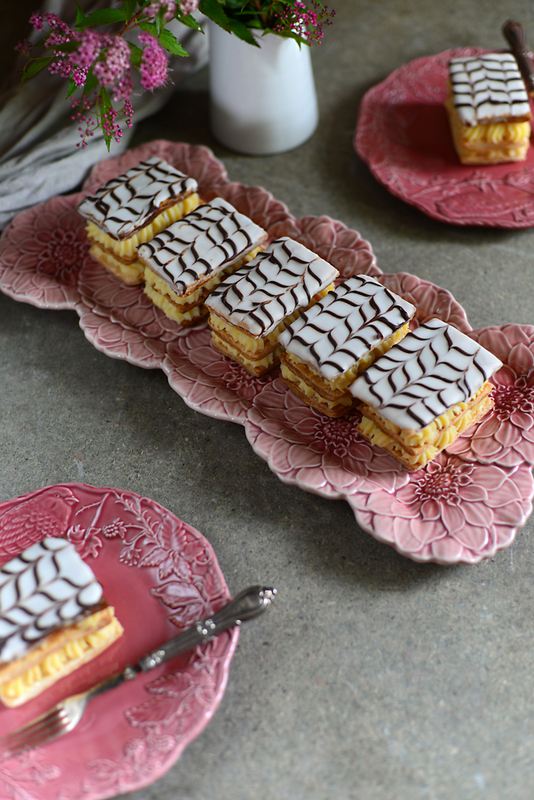 Millefeuilles means one thousand sheets, layers, or leaves and they're an old school French pastry that's airy, crispy, flaky, decadent and moreish, in all the right places. 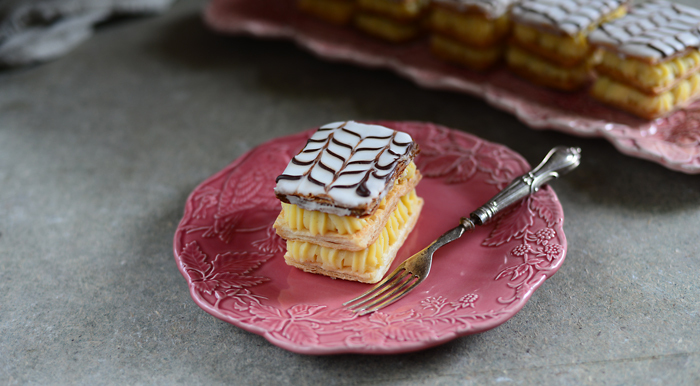 The very first recipe for a millefeuille appeared in François Pierre La Varenne's cookbook in 1651. Officially, a gâteau millefeuille is constructed of three layers of puff pastry and stabilized pastry cream (mixed with a little gelatin for a tighter cream that's not too runny), decorated with fondant and garnished with a chocolate spider web design on top. 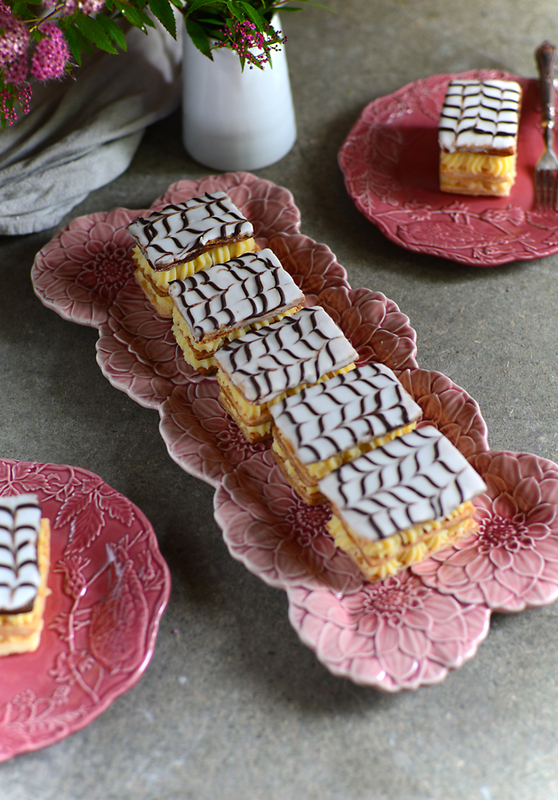 Sometimes mixed up, a millefeuille is not the same as a Napoleon, an Italian dessert where almond paste - similar to frangipane - is sandwiched between its many layers. 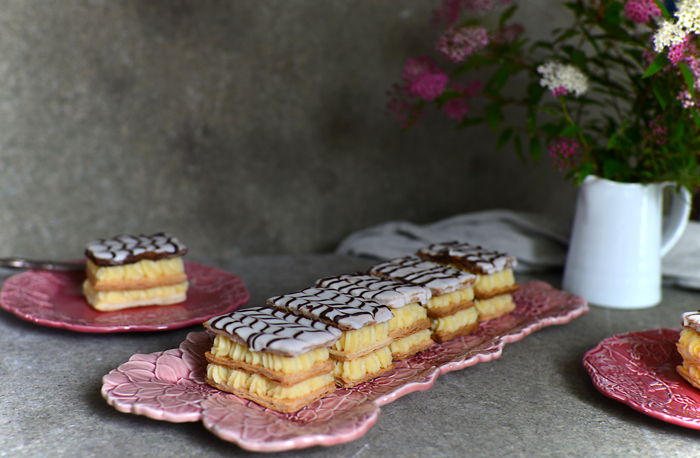 Apart from making your own puff pastry instead of using shop bought pastry, a millefeuille is not difficult to make. Actually, if you already mastered how to make a good crème pâtissière, there's nothing to worry about. So, are you up for the challenge and will you joint us and bring us some gorgeous millefeuilles? 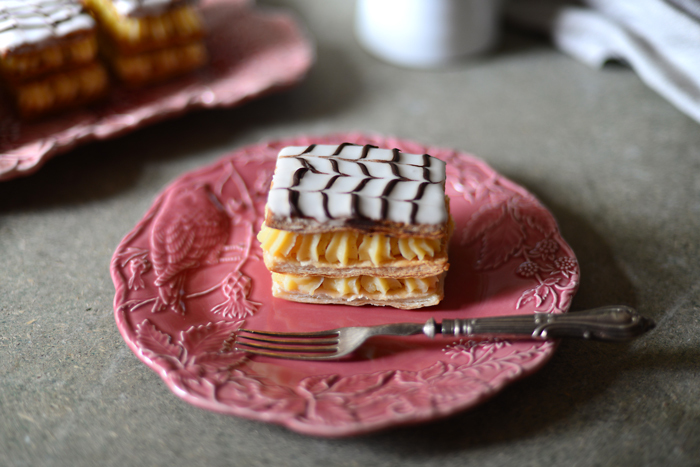 You have until the 20th of September to make and publish your millefeuilles. That same day, 20th of September, Susana will let you know in her blog, the theme for the 21th edition of the Sweet World. 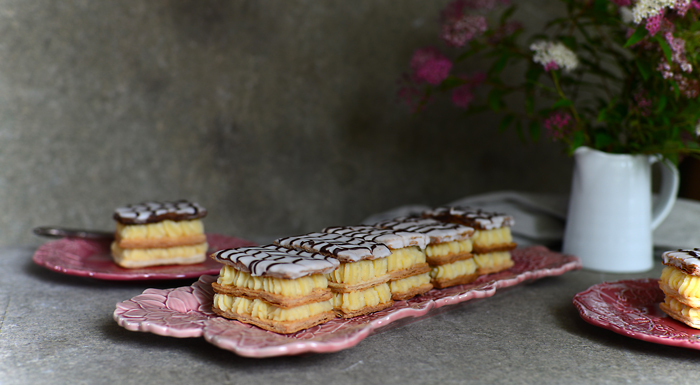 You'll have to leave your Millefeuilles link here, in this post, in order to be featured in the monthly round up that will be published here on the blog, on the 25th of September. 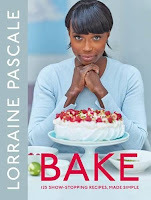 The recipe I chose, is this one that I'm leaving you today and it's from Lorraine Pascale absolutely gorgeous book "Bake"! 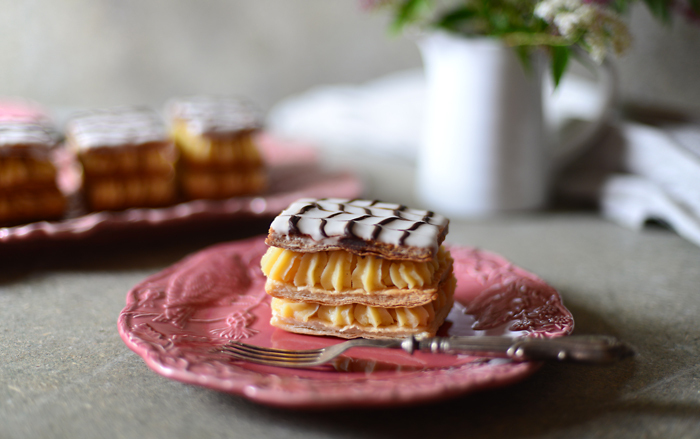 In case you need inspiration to make your millefeuilles, there's a few recipes here on the blog (here, here, here and here). 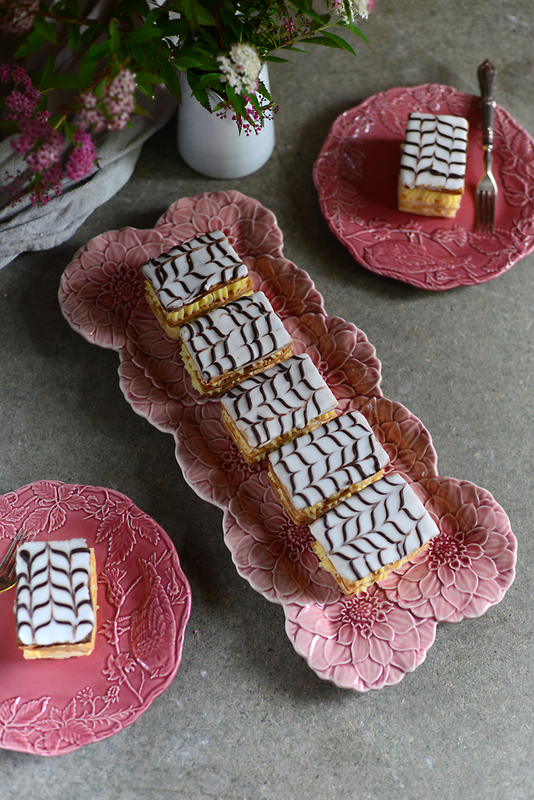 As for the puff pastry, I always make this recipe but there's this one too, which is simpler to make and will be perfect for your millefeuilles. Make sure you have 3 large baking sheets that can fit inside your fridge. Line each of the baking sheets with baking paper. Cut the pastry into 3 equal pieces an then lightly flour a work surface. Take 1 of the pieces and roll it into a rectangle slightly larger than 14 x 36cm, with the thickness of roughly 1.5mm. Repeat with the other 2 pieces of puff pastry, giving you 3 roughly equal rectangles of pastry. Take one of the puff pastry rectangles and carefully transfer it onto one of the lined baking sheets. Repeat with the other pastry rectangles and lined baking sheets, and then put them all in the fridge for at least 30 minutes to firm up and allow the gluten in the pastry to relax - this prevents the pastry from shrinking in the oven. Preheat the oven to 220°C and prepare 3 shelves in your oven. Take the pastry rectangles out of the fridge, then take one baking sheet and cover it with a sheet of baking paper, making sure that the whole of the pastry is covered. Place an empty baking sheet or roasting tin on top of the baking paper, to weigh the pastry down. This will stop the pastry from puffing up in the oven. Repeat with the other 2 baking sheets, so all 3 puff pastry baking sheets are weighed down. Place them in the oven and bake for 22 to 25 minutes. Carefully, using oven gloves, have a peek to check the pastry. It should be crisp and have gone from pale to a dark "ish" golden brown. Once the pastry is cooked, remove it from the oven and leave it to cool for a moment. Then, using oven gloves, carefully lift the baking sheets that are weighing the pastry down and gently peel off the baking paper on top. Set the pastry aside to cool down for a few moments. Then slide one of the puff pastry rectangles onto a chopping board and using a large sharp serrated knife and a ruler, trim down each rectangle until it is 12 x 35cm in size. Use a pastry brush to gently brush off excess crumbs. Repeat with the other 2 rectangles, giving you three equal sized rectangles. Put the egg yolks and sugar into a bowl and stir together gently using a whisk - you just want to combine them rather than getting air into the mixture. Add the cornflour, mix until combined and set aside. Put the milk in a medium pan with the vanilla and place over a medium heat, until just boiling. As soon as it just hits the boil take it off the heat. Pour 2 tbsp of this hot milk mixture into the egg mixture in the bowl, stirring the egg mixture all the time. Add the rest of the milk to the egg mixture, whisking all the time to combine. When the mixture is fully combined, pour it back into the same pan that you used to heat up the milk. Place the pan on a medium heat and cook for about 8 to 10 minutes, or until the mixture is bubbling and has thickened, stirring all the time to make sure the mixture does not catch on the bottom of the pan. Remove the pan from the heat and spoon the mixture into a bowl, covering it with clingfilm to stop the mixture from forming a skin on the top. Make a well in the centre and add the egg white and the liquid glucose. Beat, drawing the icing sugar into the centre until the mixture creates quite a stiff paste. Turn the paste out onto a board that is lightly dusted with sifted icing sugar, and knead until the paste loosens. Return the paste to a bowl and beat in enough of the water until you have achieved the right pouring consistency. Leave the fondant in the bowl. Mix equal parts pouring fondant icing (recipe above) with equal parts melted dark chocolate. Put the chocolate fondant in a small piping bag and set it aside. Take the crème pâtissière and beat it well with a wooden spoon to loosen it. Fill a piping bag with the mixture ad pipe the crème pâtissière all over one of the pastry rectangles. Repeat with another pastry rectangle so you have 2 pastry rectangles covered with pastry cream. Put one of the covered pastry rectangles on top of the other and pop it into the fridge to set, so that the millefeuille does not collapse under its own weight. Put the remaining pastry rectangle on a wire rack with one of the long edges facing you. Pour over enough of the white fondant to give a thin even layer, making sure you cannot see any pastry through it, then use a small off-set palette knife to quickly spread the fondant right to the edges. Using scissors, snip off a tiny bit of the end of the chocolate fondant piping bag giving you a small hole that you can use to pipe a fine line. Pipe six fine, straight lines along the length of the pastry rectangle. Take a toothpick or skewer and use it to gently drag down vertically through the chocolate lines. Then drag through the chocolate lines again, 2cm along from the first line, but this time move from the bottom to the top. Repeat this process, doing a line up and then a line down all the way along the pastry to make a pattern as shown in the photograph. Leave the fondant to set for 5 minutes, and then using a serrated knife, cut the rectangle into seven 5cm wide strips all the way along the pastry from left to right. Wipe the edge of the knife with a damp cloth or paper towel between each cut. Arrange the pastry strips on a flat baking sheet and return them to the fridge to set. Once the crème pâtissière is set, remove the layered pastry from the fridge. Place it in front of you with one of the long sides facing you and then, using a sharp large serrated knife, carefully cut it into seven 5cm wide pieces. 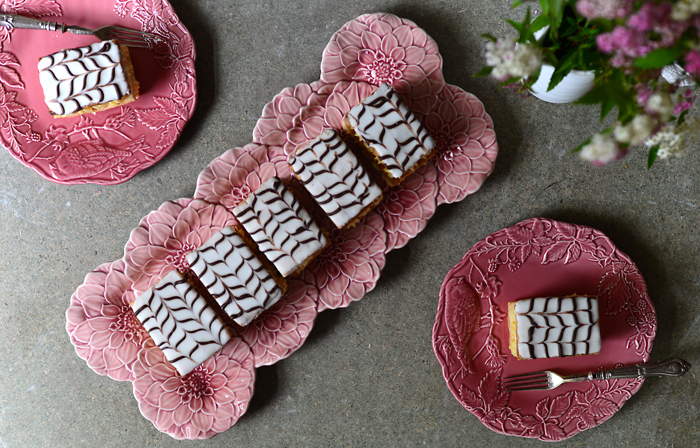 Finish each one with a feathered fondant iced rectangle top and arrange on a serving plate. Este mês e para a 20ª edição do nosso Sweet World, o tema escolhido é: Mil Folhas!! O mil folhas é um clássico francês que consiste em camadas de massa folhada recheadas com natas ou creme pasteleiro. O mil folhas é uma sobremesa (bolo) que faz parte das mais antigas e clássicas escolas de pastelaria francesas. É considerada uma sobremesa decadente, estaladiça, arejada, cremosa e viciante, tudo ao mesmo tempo e na mesma garfada ou dentada. A primeira receita de mil folhas data de 1651 e encontra-se publicada no livro de François Pierre La Varenne. Oficialmente, o gâteau mil folhas é composto por 3 camadas de massa folhada, recheadas entre si com um creme pasteleiro que, normalmente, leva gelatina, para que fique mais firme e para que sustente as camadas de forma a que estas não desmoronem. A última camada de massa folhada é normalmente coberta com um icing fondante branco e depois decorado com icing fondante de chocolate que é depois riscado em forma de teia de aranha. Muitas vezes se confundem Mil Folhas com Napoleõs, sendo estes uma sobremesa italiana parecida com os mil folhas, mas recheados com uma espécie de pasta de amêndoa parecida com frangipane. Tecnicamente não é uma sobremesa difícil de fazer. O creme pasteleiro já foi várias vezes feito noutras edições do Sweet World. A massa folhada será o vosso maior desafio, mas garanto-vos que é um muito, muito mais fácil de fazer que o bicho de sete cabeças que se pensa ser. Acreditem que, depois de fazerem massa folhada caseira, nunca mais vão usar a de compra. têm até ao dia 20 de Setembro para fazer e publicar os vossos mil folhas. nesse mesmo dia, 20 de Setembro, será publicado no blogue da Susana o tema para a 21ª edição do Sweet World. têm mesmo de deixar o link para os vossos mil folhas neste post e até ao dia 20 de Setembro (inclusive), a fim de fazerem parte do round up que aqui no blogue será publicado no dia 25 de Setembro. A receita que escolhi, esta que vos deixo, é do livro lindo da Lorraine Pascale, o "Bake"! Caso necessitem de alguma inspiração para os vossos mil folhas, só aqui no blogue têm 4 receitas fabulosas que podem ver aqui, aqui, aqui e aqui. Para a massa folhada, eu faço sempre esta receita mas também têm esta que, além de mais simples e rápida de fazer, funcionará lindamente nos vossos mil folhas. Antes de começar a fazer os mil folhas, forrem 3 tabuleiros que caibam no vosso frigorífico com papel vegetal. Cortar a massa folhada em 3 partes iguais e polvilhar a bancada com farinha. Colocar uma das partes da massa folhada sobre a bancada enfarinhada e estendê-la com o rolo da massa, até obterem um rectângulo com aproximadamente 14 x 36cm e com uma espesura de cerca de 1.5mm. Repetir o processo com as duas restantes partes de massa folhada, obtendo assim 3 rectângulos com a mesma dimensão e espessura. Colocar cada um dos rectângulos em cada um dos tabuleiros forrados com o papel vegetal e levá-los aos frigorífico por cerca de 30 minutos, a fim de relaxar o gluten da massa e evitar que esta encolha no forno. Aquecer o forno a 220°C e nele colocar 3 grelhas. Retirar os tabuleiros com a massa do frigorífico, cobrir cada um dos rectângulos com outra folha de papel vegetal, tendo o cuidado de cobrir toda a superfície dos rectângulos de massa. Colocar um tabuleiro de tamanho idêntico aos anteriores em cima de cada um dos rectângulos de massa previamente cobertos com a segunda folha de papel vegetal, por forma a fazer peso sobre os rectângulos de massa e evitar que a massa folhada cresça em demasia. Colocar os tabuleiros no forno e cozer a massa por cerca de 22 a 25 minutos. Com cuidado e usando luvas de forno para não se quimarem, levantar os tabuleiros superiores e espreitar a fim de verificar quando a massa está cozida. Esta estará pronta quando estiver estaladiça e bem douradinha. Quando a massa estiver crocante e bem douradinha, retirar os tabuleiros do forno e deixar arrefecer um pouco. Retirar os tabuleiros que estão em cima de cada um dos rectângulos de massa e retirar também as folhas de papel vegetal que os cobrem. Deixar os rectângulos de massa folhada arrefecer mais um pouco e depois, um a um, colocá-los em cima de uma tábua de cozinha e com a ajuda de uma faca de serra e uma régua, aparar cada rectângulo até obter 3 rectângulos com 12 x 35cm. Pincelar os rectângulos com um pincel de cozinha, a fim de eliminar as migalhas de massa que fiquem agarrados aos mesmos. Colocar as gemas e o açúcar numa taça grande e com um batedor de varas, bater até ambos estarem bem incorporados. Atenção para não incorporar ar na mistura. Adicionar a Maizena e bater até esta estar bem incorporada na mistura de gemas e açúcar. Reservar. Entretanto, colocar o leite e a baunilha num tacho sobre lume médio e aquecer até este querer começar a levantar fervura. Assim que o leite começar a querer levantar fervura, retirar o tacho do lume. Adicioanr 2 colheres de sopa do leite quente à mistura das gemas, batendo sempre muito bem com a vara de arames, tendo o cuidado de não "cozer" as gemas. Adicionar o restante leite quente à mistura, em fio e mexendo sempre vigorosamente. Quando a mistura estiver bem combinada, deitá-la no mesmo tacho onde aqueceu o leite e sobre lume médio a baixo e mexendo sempre, cozinhar a mistura por cerca de 8 a 10 minutos, ou até esta começar a ferver e estiver espessa. Retirar o tacho do lume e transferir a mistura para uma taça. Tapar o creme pasteleiro com película aderente (colada directamente na superfície do mesmo), a fim de evitar que se forme uma película na superfície do creme. Reservar e deixar arrefecer complectamente. Colocar o açúcar peneirado numa taça grande. Fazer um buraco no centro e neste colocar a clara de ovo e a glucose líquida. Misturar tudo muito bem, começando pelo centro, até obter uma pasta espessa. Colocar esta pasta sobre uma bancada polvilhada com açúcar em pó e amassar até a massa estar maleável. Colocar a massa de volta na taça e adicioanr uma colher de chá de água fria de cada vez, mexendo sempre, até obter uma mistura cremosa e barrável. Numa taça pequena, misturar partes iguais de icing fondante branco (receita acima) com chocolate preto (70%) derretido. Eu misturei 50g da mistura acima, com 50g de chocolate preto derretido. Colocar a mistura do icing fondante de chocolate num saco de pasteleiro pequeno equipado com um bico liso fininho e reservar. Com uma colher de pau, mexer bem o creme pasteleiro arrefecido, a fim de o uniformizar e com este, encher um saco de pasteleiro equipado com um bico decorativo a gosto. Decorar dois dos rectângulos de massa folhada com o creme pasteleiro e colocar um rectângulo sobre o outro. Levar ao frigorífico para que o creme pasteleiro fique firme. Colocar o terceiro rctângulo de massa folhada sobre uma grelha e cobrir toda a superfície do mesmo com o icing fondante branco, por forma a que não se veja a massa folhada por baixo e o mesmo fique com toda a superfície bem coberta. Com o saco de pasteleiro recheado com o icing fondante de chocolate, desenhar 6 linhas finas e separadas, em todo o comprimento do rectângulo coberto com o icing fondante branco. Com a ajuda de um pau de espetada ou de um palito, arrastar delicada e verticalmente, o icing fondante de chocolate. Repetir o processo sobre toda a superfície e com distanciamentos de cerca de 2cm da linha anterior, mas no sentido inverso ao da linha anterior, até toda a superfície estar com um aspecto de teia de aranha. Deixar o icing repousar por cerca de 5 minutos e quando este estiver seco e com a ajuda de uma faca de serra, cortar o rectângulo em 7 pequenos rectângulos iguais, limpando a faca com um pano húmido entre cada corte. Colocar os 7 rectângulos decorados num tabuleiro e colocá-los no frigorífico. Cortar os rectângulos com o creme pasteleiro em 7 pequenos rectângulos do mesmo tamanho dos rectângulos decorados com o icing. 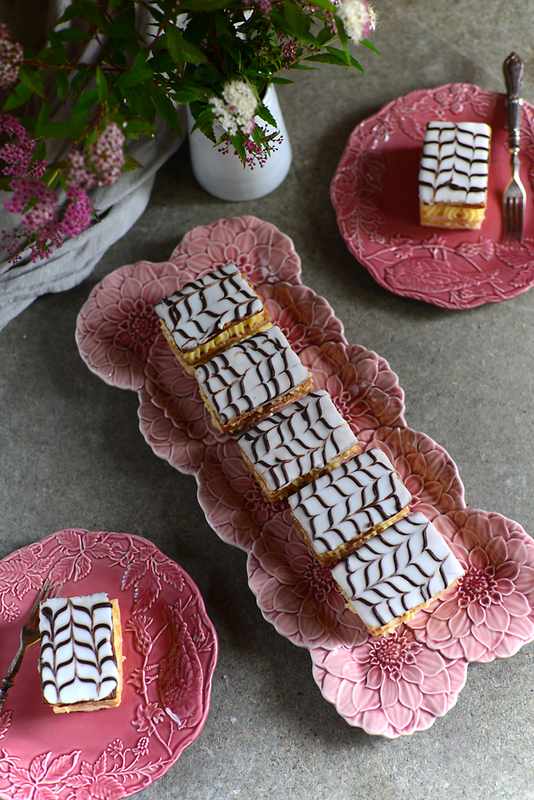 Cobrir cada rectângulo (de 2 camadas com creme pasteleiro) com um rectângulo decorado com o icing e colocá-los num prato de serviço. Etiquetas: Chocolate., Fondant icing., Lorraine Pascale., Millefeuilles / Mil folhas., Puff pastry / Massa folhada., Sweet World., Vanilla / Baunilha.